Hispanic Catholics in the United States experienced an important period Sept. 20-23. 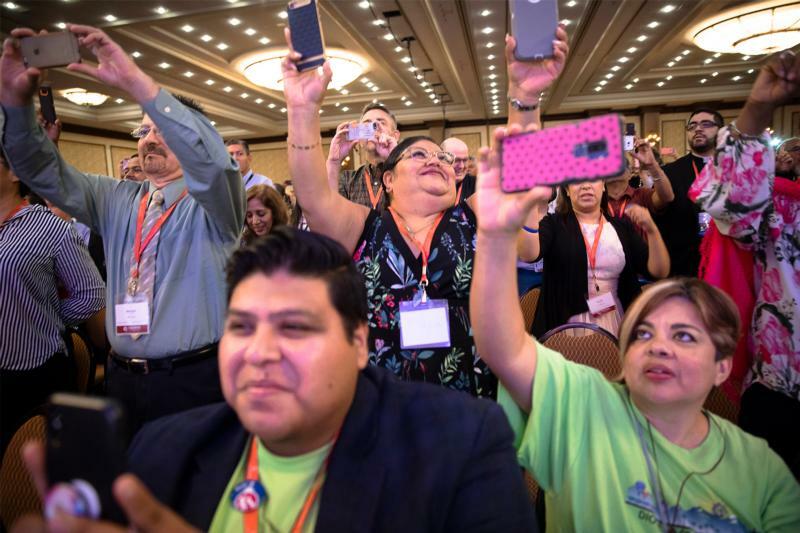 It was Encuentro V, a national meeting of Latino Catholic leaders held in Grapevine, Texas. Its main objective was to discern the ways in which the church in the U.S. responds to the Hispanic/Latino presence and to discern the way in which Hispanics/Latinos respond to the church. It was the fifth such national gathering held from time to time since 1972. A special feature of Encuentro V was the display of the Encuentro Cross that was blessed by Pope Francis during his visit to Philadelphia in 2015. Leading the Philadelphia delegation of 21 to Texas were Bishop John McIntyre, Bishop Edward Deliman and Kathia Arango, director of the Office for Hispanic Catholics. There is a special urgency to have a pastoral plan for youth ministers; many of the young in the community are second or third generation in the U.S. and do not speak Spanish, Arango explained, but they may not feel welcome in a typical English-speaking parish, because of cultural differences. As a prime example, the music is different so that for them it lacks the vibrancy of Hispanic culture, so rich with drums and guitars. “We must address that before we lose them; we need to refocus on them,” Arango said. One of the problems she sees is just as prevalent in the general ministry as it is in the Hispanic ministry. Parishes put out a call for catechists to teach PREP and when volunteers step forward, they are given a book and told, “teach the children,” with no real training. Another problem, perhaps unique among the immigrant community in general, not just Hispanics, is the requirement for those who work with youth to have a safe environment background check, which is impossible to obtain for those in the community who do not have valid United States documents. She admits the priorities are challenging. Another member of the Philadelphia delegation was David Serrano, the director of religious education at Visitation B.V.M. Parish, Philadelphia. Not everyone at the Encuentro was Hispanic, and among the Philadelphians obviously Bishop McIntyre and Bishop Deliman there was also an African sister and a Filipino sister. While Encuentro V was a national event, on the local level Hispanic Catholics will participate in a Hispanic Heritage Mass and Formation Day at the Shrine of St. John Neumann and St. Peter the Apostle Church on Saturday, Oct. 6. Registration will begin at 8 a.m. followed by a 9 a.m. presentation by Redemptorist Father Bruce Lewandowski and a procession of countries and parishes. Mass will be celebrated by Bishop Deliman at 11 a.m. and following lunch there will be a music presentation by members of the Associacion de Musicos Pastorales Hispanos del Este.